Back in 2007, hubby and I knew that we would probably be moving within a few years. (We did…in 2009.) Since we had already moved eleven times in ten years, and lost some things that were important along the way, I decided to pack up some of the more sentimental items so that 1) they would not be lost, and 2) so they would be out of the way while I went through the non-precious stuff and got rid of the junk. I was meticulous about labeling. It is so frustrating to look for something you packed away, only to be confronted with a scene like the warehouse at the end of Indiana Jones and the Lost Ark. So I started with box #1, put the date February 8, 2007 at the top, and listed what was in it. The first box was easy. 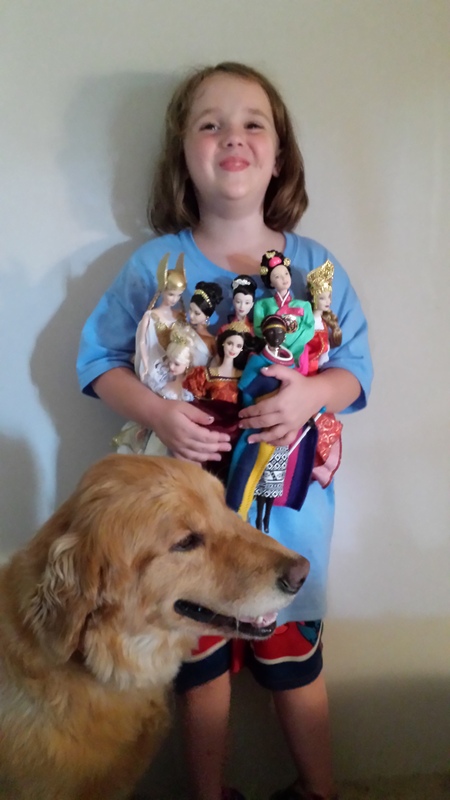 I had a small collection of “Princess of the World” Barbie dolls. I had dreams of them being a “special toy” I might sometimes let my children play with, under supervision. My oldest was eight at the time. She had no interest in Barbies, and was the kind of child who would have quickly scattered every piece to the four winds, never to be found again. Fast forward to 2014, and we have about twenty boxes in our basement. Genealogy material, diplomas, and other things that hold sentimental value but don’t necessarily need to be out and accessible on a daily basis. They’re still boxed because our house is a never-ending fixer-upper. These things might just stay in the boxes until we move back to Colorado someday. 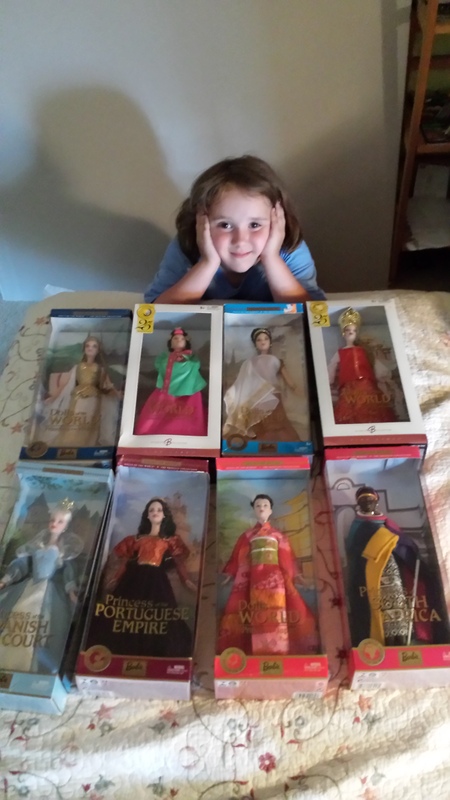 Last week, my younger daughter mentioned she wanted more Barbie dolls to go with the few she has. I remembered that I had the princesses, and I went to look for the box. Thanks to OCD labeling, it was easy to find and easy to take out of the pile. Nine months before my youngest daughter was born. Hubby and I tried for ten and a half years to get pregnant. After many different treatments, it finally worked in mid February, 2007. There are a lot of precious things in the basement, packed away in boxes. They say if you can go a year without using something, you probably don’t need to keep it. That’s good advice, and I know I’m a pack-rat by nature. For now, it puts my mind at ease knowing that the “important” stuff is safe. We have remodeling to do, and junk to sort out and throw away. In the meantime though…I might take another look at these boxes, and see if there’s something else whose time will pass by as my kids grow up so fast. This entry was posted in Commentary & Musing and tagged Barbie, Barbie dolls, daughter, infertility, precious memories, princess, world. Bookmark the permalink. I’m so glad that she not only loves them, but cherishes them! After taking off their shoes and putting them away, she renamed them all after Disney princesses, labeling each with a post-it note lol! From the age of 8, I collected Breyer’s horses. For years, they lived in my cedar chest, and then I saw an ad on a recycling list. A pair of homeschooled girls was looking for model horses. I was pregnant for my second son. Today, as a matter of fact, is his birthday. He was to be our last child, so I thought I would never have a daughter of my own. I gave all the horses away. May you find more treasures, and may the delight of ownership and discovery fill your fixer-upper! Happy birthday to baby Elijah, and hugs to you. After a few years of infertility treatments, I took the rubbermaid tub (my version of a cedar chest) of baby things we’d collected and donated them to a local charity for new mothers.The social worker’s eyes went wide when she saw the tub…slightly smaller than a bathtub. I don’t begrudge those things either. What I DO regret is that, even though we saved the size 1yo onsie of an STNG uniform I bought LONG ago at the Trek hotel in Vegas,when my daughter was 1yo we couldn’t find it lol! I have it put away where I can find it now. Hopefully we’ll adopt again someday, or maybe it will wait for a grandchild. I love that you have a ST:TNG onesie – and, wait, there was/is a Trek hotel in Vegas?! I hope you do get to snuggle a little one who’s wearing it! One question, though – what color will the wee bairn to be, if there is one, be sporting? I went back and checked…it’s still in the drawer, and it’s red. I went to Vegas for a Scottish Dance Teacher’s convention with my mother. We took a little free time to go to “The Star Trek Experience.” The main attraction was a kinda live-action walk through. You start in an elevator-like thing with about 20 other people, then the lights go out and they do the “Oh no, something went wrong!” thing. They lead the group from one area to another, recreated to look like the Enterpirse D, with live actors playing random crewmembers who interact with (recordings of) the main characters who appear on the vid screen. It ended with a virtual reality ride where you’re in a shuttle that moves while the IMAX type screen in front of you shows the shuttlecraft eventually returning to present day Las Vegas. Very cool! The attraction let out into a gift shop area including Quark’s bar. Red, eh….uh oh! Of course, that’s a less dangerous thing in NextGen, but, still….red….uh oh. It sounds like it was a nifty hotel. I was in Vegas on either side of our wedding trip (we were living at the Grand Canyon, and flew back here to NY to get married). The show might have been a little much (so was the airplane!) for an acrophobic like me. But fun, if you can handle that shuttle flight simulation. Some years back ,I visited an exhibit on the science of Star Trek, and Jim and I saw a traveling exhibit of memorabilia – I think maybe in Canadian Niagara Falls, during our honeymoon (we’ve traveled kind of a lot, and things get jumbled in my head! It could have been somewhere on the West Coast, too…).